The VeryPDF Printer Drivers Auto-print SDK can be used to programmatically print and convert files with the VeryPDF Printer Driver without any user interaction. The Auto-print is recommended in several scenarios such as, creating a customized batch converter and Web Service based document conversion. The SDK includes a DLL and ActiveX control for automated printing and batch conversion. The Auto-Print SDK can be used by developers to print Adobe PDF documents, Microsoft Office Word, Excel, Publisher, PowerPoint, RTF documents, image files such as PNG, JPEG, BMP, GIF, TIFF, FAX and web pages such as HTM, HTML, XML directly from their applications. The Auto-Print SDK includes a Batch printing component, Auto-Print Samples with an API for creating custom batch conversion solutions either with or without user interaction. The Auto-Print technology can be used with VeryPDF Printer Drivers. By using Auto-Print technology, commonly used documents can be printed and converted automatically without any user interaction. The Auto-Print SDK contains samples with full source code written in C++, C#, VB.NET that show how to implement applications capable of Auto-printing. These powerful samples can help developers build applications that can print out MS Office documents such as Word, Excel, Power Point, Visio, AutoCAD, HTML, XPS files and Adobe PDF files without any user intervention. 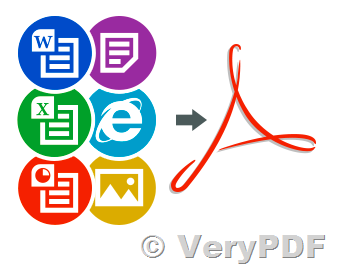 The samples can utilize multiple VeryPDF Printer Drivers for parallel document conversion! Auto-print and Auto-print Service uses VeryPDF Printer Drivers for converting documents in a simple and easy-to-use user interface. Auto-print Service monitors the specified directories, and process documents from the monitored directory. The Auto-print Service sample demonstrate how convert documents from windows services. The Printer Driver settings can be changed simply from the sample applications user interface. Auto-print and Auto-print Service created detailed log files during the conversion, to help developers and administrators identify and troubleshoot the occurring issues. Into Failed, Processed, Converter (Output) directories to help users and developers see through the converted, processed, and problematic files immediately. the conversion never stops! Auto-print and Auto-print Service handles erroneous, damaged, password protected, and not printable documents and continues the conversion after moving the problematic document into the failed directory. Auto-print Service runs under "Administrator" account instead of under a particular user or System Account, that allows the Auto-print service to continue the document conversion even after the current user is logged off in unattended mode. For converting documents with the Auto-print SDK, at least one VeryPDF Virtual Printer Driver need to be installed on the system. Image files: TIFF, FAX, JPEG, GIF, BMP, PNG, etc. How to Remove Windows Vista/7 Printer Driver? How to convert doc to pdf by Document Converter? How to make properties default when edit comment in docPrint preview application? This entry was posted in docPrint Pro, VeryPDF SDK & COM and tagged docPrint, PDF Printer, print sdk, printer sdk, virtual printer.. Bookmark the permalink.